Emergency department (ED) attendances are continuing to rise, and medical and nursing teams are working under considerable strain. ED clinicians are used to thinking on their feet and possess the skills to multitask, and juggle ever-changing and competing priorities against the clock. This article reports the findings of a study that enabled ED clinicians to take time out to reflect on some of the difficult decisions they make daily, and to ask whether they consider ethical principles in depth, and if they are of any practical help. Findings reveal that autonomy, beneficence, non-maleficence and distributive justice are evident in contemporary EDs, and clinicians need to be encouraged to incorporate ethical reasoning into their reflective practice. 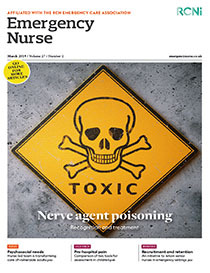 The term ‘clinician’ refers to doctors and nurses in this article.